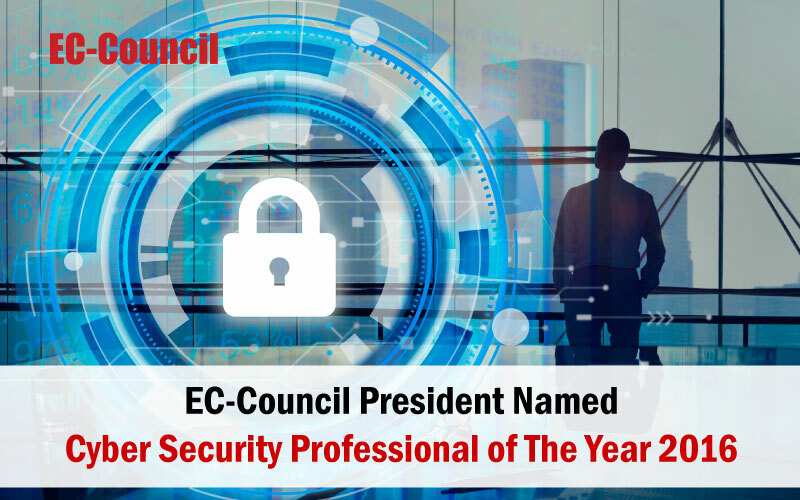 2016 – Jay Bavisi, CEO, EC-Council Group and Chairman of the Board, EC-Council University, has been honored as the Cyber Security Professional of the Year by CyberSecurity Malaysia for the second year in a row. His contribution to the national cybersecurity industry has been recognized by his peers as having set an influential and positive benchmark in Compliance & Risk Management practices. 18 October 2016 Kuala Lumpur – The Ministry of Science, Technology, and Innovation, Malaysia (MOSTI) and CyberSecurity Malaysia (CSM) announced today the award of the Cyber Security Professional of the Year 2016 to Jay Bavisi, president and CEO of EC-Council. Jay was also the recipient of the award in 2015. Jay is the president and CEO of EC-Council, the world’s leading information-security certification body since the launch of their flagship program, Certified Ethical Hacker (CEH), which created the ethical hacking industry in 2002. It operates in over 140 countries and has over 700 partners across the globe. Since the launch of CEH, EC-Council has added industry-leading programs to their portfolio to cover all aspects of information security, including EC-Council Certified Security Analyst (ECSA), Computer Hacking Forensics Investigator (CHFI), Certified Chief Information Security Officer (CCISO), among others. EC-Council Foundation, the non-profit branch of EC-Council, created the Global CyberLympics, the world’s first global hacking competition. EC-Council Foundation also hosts a suite of conferences across the US and around the world, including Hacker Halted, Global CISO Forum, TakeDownCon, and CISO Summit. In June of 2014, Jay was elected to the Colloquium for Information Systems Security Education (CISSE) Board of Directors. CISSE provides a forum for dialogue in the United States among leading figures in government, industry, and academia and is a joint effort by the NSA and DHS. In 2013, CISSE recognized Jay with the 2013 Industry Leadership Award for his pioneering work in the information security industry. CyberSecurity Malaysia is the national cybersecurity specialist and technical center under the purview of MOSTI, with a passion to provide excellent services to ensure a safer cyberspace for everyone. It began as the Malaysia Computer Emergency Response Team (MyCERT) in 1997. In 1998, it grew to become the National ICT Security & Emergency Response Centre (NISER). In 2007, NISER was transformed and renamed CyberSecurity Malaysia. The 2016 Malaysia Cyber Security Awards honor professionals and organizations that demonstrate excellence, innovation, and leadership in the information-security risk management sector. The award recognizes best practices, outstanding performances, and qualifications by individuals who have contributed to enhancing the overall national cybersecurity framework. Evidence of improving cybersecurity policies and procedures–not only through innovative approaches, but also through tactical or influential strategies–was collected and compared against the ability to manage and uphold internal cyber defenses and security culture . Jay–who is the chairman of the EC-Council Foundation, a non-profit charity dedicated to raise awareness of information security, build capacity, and promote world peace–has contributed to projects to help those less fortunate gain technical knowledge, help wounded warriors become cyber-experts, and help kids become aware of cyber risks. Additionally, Global CyberLympics, the world games hosting over 1,000 information security players from over 100 companies globally and from over 80 countries, was the brainchild of Bavisi. – Dr. Amirudin Abdul Wahab, Chief Executive Officer of CyberSecurity Malaysia.